Any organization that has more than a handful of computers needs a solution for managing and troubleshooting the systems on their network. Such a solution should include remote control capabilities for remote servers, but should also include features that allow you to examine and modify key configuration components. Solarwinds claims to offer such a solution with the upcoming DameWare 10.0 and I just couldn’t wait to check it out. Whenever I write a product review, I like to initially attempt the deployment process without using any documentation. That way I can get a feel for whether it is easy or difficult to get the product up and running. In the case of DameWare however, I was provided with a pre-release build and no documentation. As such I was completely on my own. The software that was provided to me was a zip file, which contained a single .EXE file. Once extracted, the .EXE file was only about 75 MB in size. 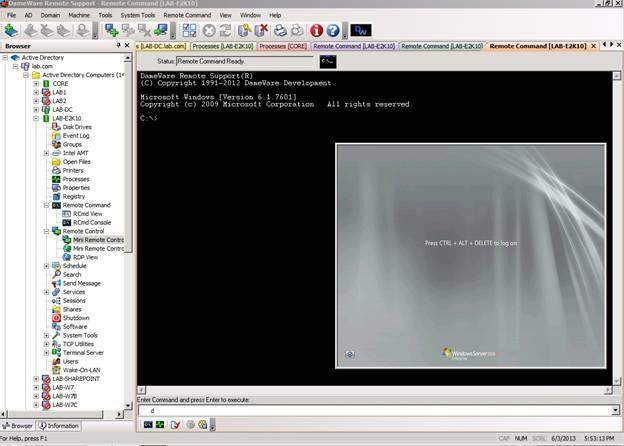 For the purposes of this review, I decided to install DameWare onto a virtual server that was running Windows Server 2008 R2 Enterprise Edition. The installation process involved working through a fairly simple Setup wizard. The wizard prompted me to accept the license agreement and to confirm my installation path. The entire installation process only required about ten clicks and five minutes to complete. In a production environment however, I would expect the installation process to be significantly faster since the virtual machine that I used for this evaluation was running on my laptop. When the installation process completed, I opened DameWare by double clicking on the icon that the installer had given me the option of placing on my desktop. Upon doing so, I was presented with the screen shown in Figure A. Figure A: This is the screen that DameWare 10.0 initially displays. The first thing that I did was to expand the Active Directory Computers container. Doing so displayed a list of all of the machines that had been registered to my lab domain. DameWare differentiated between computers that were currently powered on and those that weren’t. In the interest of making this review representative of a real world environment, I paused to start up some additional virtual machines. While I was waiting for some more virtual machines to start up, I began to realize that the way that the Active Directory Computers container displays my computers that are registered to my lab domain was perfect for small scale testing, but it probably wouldn’t be very practical for large domains containing thousands of computers. Fortunately, Solarwinds appears to have thought of this too. The container beneath the Active Directory Computers container is called Active Directory Quick OUs. This option allows you to add your Active Directory OUs to the console, as shown in Figure B. That way you can view the computers on your network in a more manageable way. Figure B: The Add Quick OU dialog box allows you to add individual OUs to the console. Incidentally, if you don’t want to have to manually add a bunch of OUs to the console then you can simply use the Active Directory Users and Computers container. This container shows you all of the domain’s OUs. 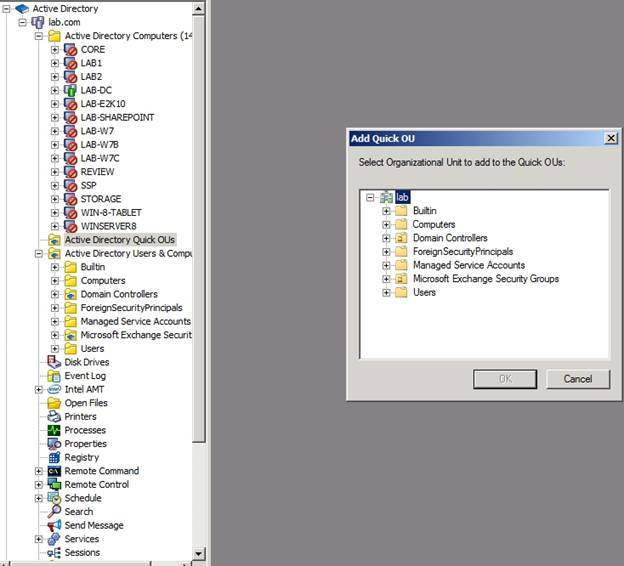 In case you are wondering, the Active Directory Quick OUs container seems to be most useful for use in large domains with lots of OUs in situations in which you really only need to use DameWare with a few of the existing OUs. It could also be useful if there are OUs that you reference more often than the others. 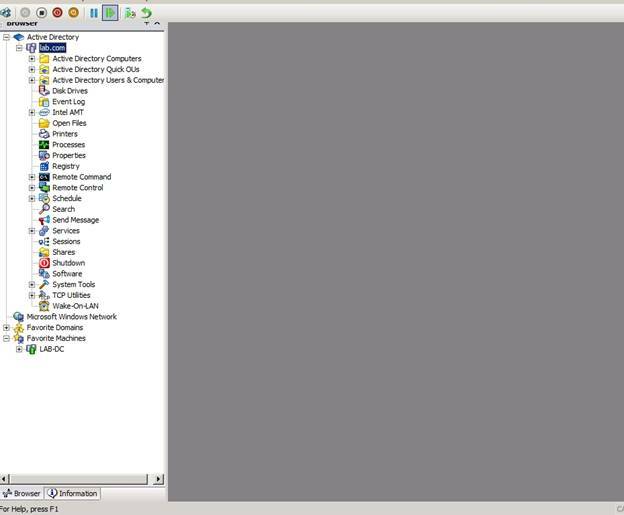 If you look at the figure shown above, you can see that just beneath the Active Directory Users and Computers container, there is a large series of containers with names such as Disk Drives, Event Log, and Open Files. Most of these containers are designed to display a specific type of system information. For example, if you right click on the Process container and chose the Open command, you will be provided with a list of all of the processes that are running on the local server. The individual processes are clickable, which is handy if you want to drill down to receive more detailed information, as shown in Figure C.
At first, this feature might seem to be of limited use. 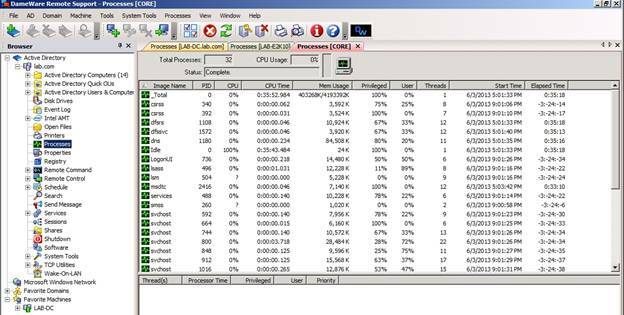 After all, you can get process information from the Windows Task Manager. However, there is more going on here than meets the eye. Figure C: DameWare provides information about processes running on the local server. If you were to expand the container corresponding to one of the other computers on your network, you would see a similar set of options to those that are listed on the main console screen. However, these options are server specific and allow you to acquire information for remote systems. What is more interesting however, is that if you return to the main Process container, you will see a tabbed view of the processes that are running on each of the servers that you individually examined. This tabbed view, which you can see in Figure D, makes it easy to compare the process load across various servers. Of course I am just using the Processes container as an example. DameWare provides similar functionality for other containers such as Services and Registry. Figure D: DameWare allows you to compare data across systems. Obviously, it is very helpful to be able to examine key properties of remote servers and to be able to perform comparisons across servers. Such capabilities will likely to prove extremely beneficial for troubleshooting, especially in situations that involve performance problems or problems with applications. In addition to its statistic gathering capabilities, DameWare also includes remote control capabilities. The remote control functionality allows you to connect to the server console or to open a remote command prompt. Both of these options require a client component to be installed onto the remote machine, but the required client can be deployed directly through the DameWare console and client deployment is very quick and easy. You can see what both the command prompt and the console remote sessions look like in Figure E. Normally the remote environments are displayed in a larger size. I simply shrunk the windows so that I could fit everything into a single screen capture. Figure E: DameWare offers both console and command prompt remoting. The biggest new feature in DameWare 10.0 is remote support from iOS mobile devices. DameWare makes it possible to remotely connect to Windows computers on your network using an iPad or an iPhone. This functionality works seamlessly if the device is operating on the organization’s private network, but external support can also be enabled by placing a computer that is running the DameWare Mobile Gateway Service into the organization’s DMZ. The DameWare mobile app includes a virtual mouse with left and right click functionality as well as drag and drop. It also has hotkeys for launching a command prompt and a ctrl-alt-del on remote machines. Unfortunately, I was unable to test these features because I do not own an iPhone or iPad, but if they work as claimed, they should make controlling a remote desktop much easier than the standard iOS touch controls. Obviously mobile device based management is a great feature, but I do wish that DameWare offered mobile support for Windows Phones, Windows RT Tablets, and Android devices instead of only supporting iOS devices. I hope that support for these platforms is part of the future roadmap for this product. All things considered, I think that DameWare 10.0 is a solid, well written, and most importantly, useful product. Although I was working from a prerelease version I couldn’t find any noticeable bugs. Furthermore, even though I was not provided with the documentation, it really didn’t matter. It only took me about ten minutes to become comfortable with using the software. 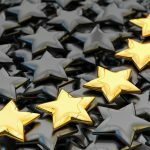 When writing reviews for this site, it has become customary for me to assign rating to products on a scale of 1 to 5 (with 5 being the best). I think that DameWare disserves a score of 4.8, which easily earns it a WindowsNetworking.com Gold Award. The reasons for the score were its ease of use, overall usefulness, and the ease of deployment (I didn’t have to set up any sort of manual database connectivity). Learn more about DameWare 10.0 or Download it now!